When announcing that Sebastien Vettel had won the Autosport Awards Rookie of the Year, presenter Steve Rider couldn't resist a chuckle when noting that Timo Glock had also figured in the voting. While there was little doubt that the trophy would be heading to Vettel, Rider was a little harsh on the Toro Rosso star's countryman. In his quiet and unobtrusive way, Glock had an excellent first season at Toyota, and crucially he finished the year on a swing of upward momentum that should continue into 2009. 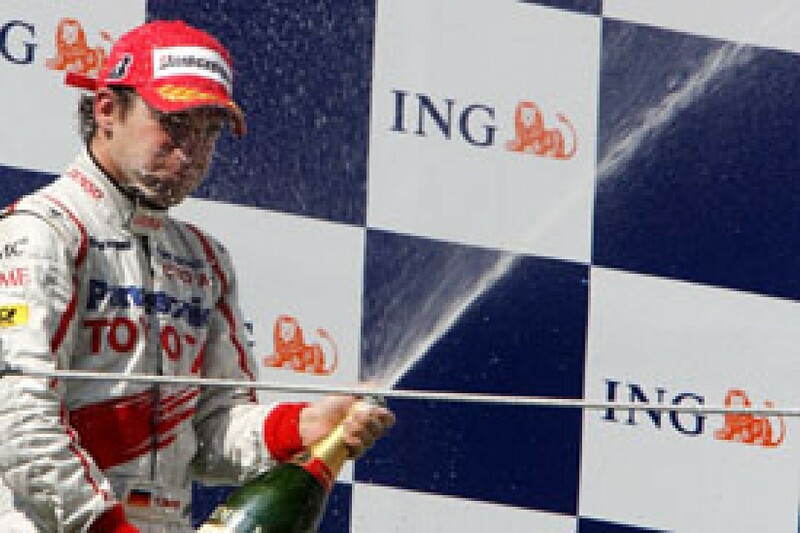 Despite having more than his fair share of bad luck, Glock scored 25 points - only six fewer than veteran teammate Jarno Trulli - and finished tenth in the world championship. His total included a fine second place in Hungary, while strategy gambles paid off in several races and he clawed his way into the points. Glock's ability to take any chance that was presented was never more obvious than at the Interlagos finale, where he stayed out on dry tyres and almost altered the destiny of the world championship. Ultimately, he lost a couple of the spots he had gained, but he still ended up better off than if he'd changed tyres at the same time as everyone else. Vettel paid his pal a compliment: "Glock had no chance. If you could see it, it was magic what he did in the car on the last couple of corners, to hold it on the circuit. He had no chance to defend, no way." Timo has not followed a traditional route to the top. 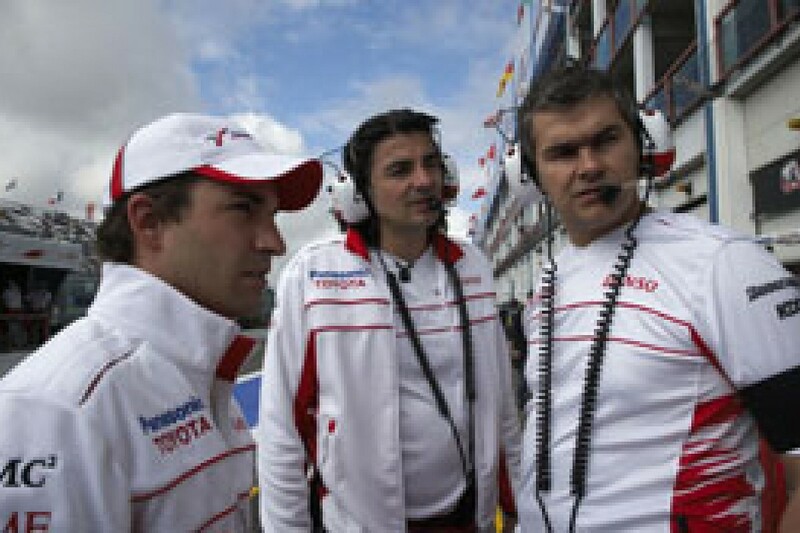 He's long had an ambitious management team and useful funding behind him, and back in 2004 he was pushed straight from F3 to the Jordan third driver role. The move was a little premature and it could have been a total dead end, but he showed well when he unexpectedly got an opportunity to race. His F1 options then ran out temporarily, but after a diversion into Champ Car, followed by two successful seasons in GP2 and some BMW F1 testing, he finally landed another chance this year. In retrospect, it was a pretty smart decision by Toyota to go with the GP2 champion. Indeed, over the course of this season there were probably times when BMW boss Mario Theissen wondered how he'd managed to let not just one but two young German talents slip through his fingers. The year didn't start as well as Timo had hoped, however. Like several other drivers in 2008, he found that the car was much more suited to his teammate's driving style than his own. "At the beginning the tests were really, really difficult for me," he says. "I didn't expect even after the last test at Barcelona to be top ten in Australia, as I was struggling quite a lot at the beginning of the year. But I just kept my cool and said just progress, do it step by step, and just work as hard as possible. "It was quite on the understeery side and a bit nervous under braking. It was tricky to set up the car between low speed corners and high speed corners the right way. If you set it up for high speed corners, you struggled in low speed, and the other way around as well. That was the biggest problem, to understand the car and what direction it has to go, and what it needs to be quick. "Every single car is completely different, from a button on the steering wheel to the aero package. The car behaviour, and the car characteristics, were a bit different to the BMW. I had to talk to my engineers and we had to find a way where we understood each other. "From Canada on, step by step we went in the right direction and they did a mega job. It was quite disappointing at the beginning of the year, but in the end it's just experience for yourself. When you work your way through a negative period you just get stronger out of it - that's what I did in the past years, and this year as well." Glock's early struggles were reflected in the results, and he didn't do a lot of scoring in the early races. There was a spectacular bucking bronco ride when he ran wide in Australia and a few first lap skirmishes before things began to get better. "I have to say when you see the start of the year, the first five or six races were quite tricky until Canada. Then we worked our way up in terms of bringing the car more in my direction. Also, I got used to the team and I adapted my driving style a little bit more to the Toyota. It took a bit, but from Canada onwards I think it was a good second half of the year." The undoubted highpoint was Budapest. Quick all weekend, he started fifth and, helped by problems for Massa and Hamilton, he followed winner Heikki Kovalainen across the line. Even better, it came shortly after his huge crash at Hockenheim. "Hungary was the highlight. I knew already in the first two laps of free practice that when you can keep it in that window, the car is really good. I had a lot of confidence already after two laps and I knew that we could be well in the points. With the high downforce package we looked quite strong, maybe not super efficient in terms of top speed, but in the end we had quite a lot of downforce and this was really important in Hungary. "We were quickest in the last sector and that made us really competitive there. Everything came together and I could just get it right on that weekend, where everything was 100 per cent perfect. The best thing was to cross the finish line in second and see all the mechanics hanging over the pit wall. Everybody was really happy and for me it was really good." Equally impressive were his runs to fourth place at Montreal and Singapore, two difficult races where survival was all. "Canada and Singapore were quite difficult but I could just manage to make no mistakes, to stay on track and keep cool. Every time, I had a Ferrari behind me. In Canada it was Felipe Massa, and in Hungary and again in Singapore, Kimi Raikkonen! That shows that I can do races without any mistakes and I think that was quite positive." There were other good races too, although they didn't always convert into results. "Especially when you look back, we lost quite a lot of points as well. At Hockenheim we had a really good race but couldn't score any points. At Magny-Cours, Jarno looked quite strong but we made a mistake with the set-up and the car was just not good enough in the race. So we had a lot of races where we didn't score points. But it was a good, solid first year. "The disappointments included Malaysia, where I had a good performance but was out after half a lap. At Monaco I made quite a lot of mistakes, I was quite pissed off with myself after that race!" His early struggles to get tyre temperature didn't help, but once he got into the swing of things, Glock impressed in qualifying. 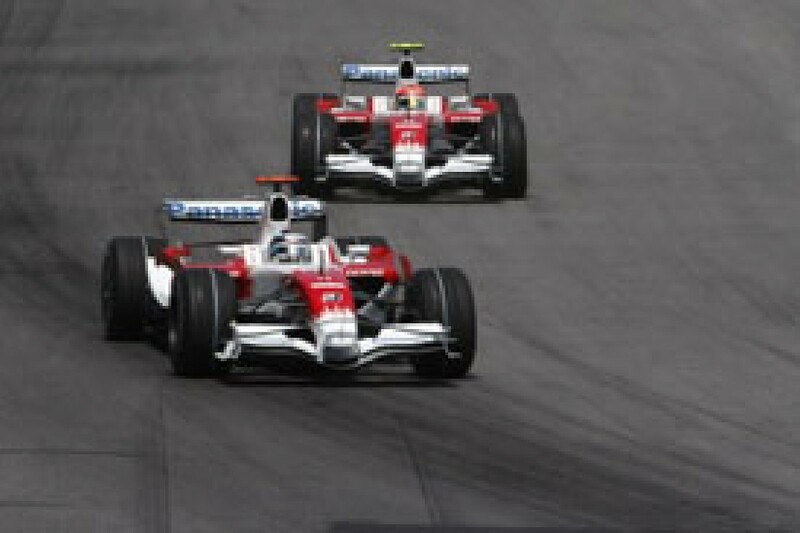 However, he had the bad luck to be up against Trulli - a man known to be brilliant over one lap. Timo only beat him four times, but of more interest was their respective form in Autosport's unofficial end-of-year supergrid. Jarno ranked eighth and Timo tenth, split by Mark Webber. Significantly, the two Toyota guys were closer together in terms of average lap time than any other team's pair of drivers. Not bad for a first season against a teammate who makes a point of getting Saturday right. "Oh yeah, he's not easy. He is a good benchmark for qualifying, for me one of the best qualifiers or even the best qualifier for one lap. And as well he's really strong in races. I like to work together with him, he's really experienced, really straightforward and he just tells what he needs for the car, and that's it. He's not talking around any problems, he's just putting it on the table. "I think this year we both pulled strongly in the right direction together and I think that helped the team as well, to understand what the car needs. That was positive and for me even better because I can learn quite a lot from Jarno. Sometimes he just closes the book a little bit and doesn't give me all the secrets! But at the beginning he helped me quite a lot and now I think we work really well together." Toyota may look like a fairly apolitical place compared to some teams, but over the years a few drivers have carried the can for failure. Timo enjoyed a hassle-free honeymoon period and he feels wanted. Certainly after the dour and moody Ralf Schumacher he must have come as a breath of fresh air. "The top management are concentrated and focused on the job that we do. They know that we all have to improve, everybody has to improve, and I never got any pressure from the top management - they're quite happy with the job that I did so far. They can analyse the races as well, they know the speed was there. I was a bit unlucky and that was the reason they put no pressure on my side. Hopefully we can put it all together next year really strongly for another step." Trulli may have kept a few things for himself, but Timo clearly did a lot of learning on his own, regularly analysing what he could do by way of improvement. "The main point is the weekend is so long and you have so much stuff to do. You have a lot of PR stuff, a lot of marketing events during the weekend. You have an interview, then two minutes later you have to sit in the engineers' office. Then you have to get your head clear for the free practice, then you jump out of the car and do interviews again. And you are with your head already in meetings. This is quite tricky. "At tests you do so many things and then at 8pm when you are done you have to review the whole test day and get things back in your memory. OK this was good, this was the direction to go in. "From test to test and from weekend to weekend, I was sitting down thinking what did I do wrong? What part of the weekend screwed my race or qualifying up because I wasn't concentrated? Then I sorted out over the first races how things needed to be done and I just found a rhythm." So does he feel better prepared for Melbourne 2009? "I think in terms of a race weekend, yes. But next year will be completely new again, we'll have a new car and you need to understand how to develop it. It's kind of another first year in terms of the race car, but the rest of the weekend I think I'll be well prepared. "I hope I can carry on where I stopped this year, with maybe another little step on my side. I'm confident now that I can go the pace of, for example, Jarno, and the other top guys - and I can be on the podium as well. It's good when you get this experience in your first year of F1. I think it will be much easier when I am in the plane to Australia. "To be quicker than your teammate is a goal every time, and when you are quicker than the quickest guy in the paddock in qualifying, that's a positive. But in the end, the points count in the championship and this is what I'm looking for, to do another step in the championship and be a regular in the points. It's easy to say now, but nobody knows where we are, so we have to wait and see how the test goes and get a first feeling for the car." There are different schools of thought about how things might unfold once the definitive 2009 cars appear. Will the new rules package favour experience, in other words the guys who've seen it all before? Or will there be an advantage for the younger generation, those who are less set in their ways, and perhaps more open to change? "It's a question mark. Every driver is different. I think a lot of experienced drivers will have no problem to adapt and understand what a car needs. But maybe what you say is right, that it will help a young, fresh driver who's used to a lower downforce GP2 car with slick tyres. "The mix in our team with Jarno is good, he understands the car quite well and what it needs to improve, and I think this is quite a good mix for next year for us. But it's really tricky to say what direction it will go in terms of what teams will be strong, and where we are. "There will be a lot of stuff to write about next year! And, as well for the teams, there's a big motivation for everybody, and everybody is really looking forward to a big change in F1. I think that will happen next year."